Tyne Tunnel. Picture as shown by the North East Combined Authority Traffic Cameras yesterday. Tyne Tunnel chiefs are to modify access to the subterranean roadway for motorists from South Tyneside in a bid to ease congestion at nearby traffic hotspots. They plan to permanently open both lanes leading to the tunnel entrance from Jarrow to drivers of any vehicle from Monday (NOTE - Sept 24). Since the second Tyne Tunnel (TT2) opened in November 2011, one lane has been reserved for specialist vehicles, such as fuel tankers. This inspection lane, which runs alongside a second access road used by other drivers, carries only around 10 vehicles an hour. 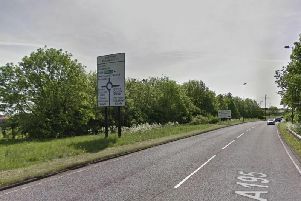 Tunnel bosses expect the change to reduce traffic build up on approach roads and at the roundabout above the entrance in Jarrow. They say they are acting partly in response to queries from tunnel users as to why the inspection lane remains off limits to them even at peak times. Both lanes will still filter into one before joining the main A19 dual carriageway which leads under the tunnel in the direction of North Tyneside. Chris Ward, TT2’s customer operations manager, said: “We see this as a very positive development. “The tunnel has a service lane that’s largely empty and we have had numerous queries from motorists as to why this can’t be opened up. “They have asked why they are having to queue when this lane is usually empty. “We know that there can be congestion in Jarrow on the roads leading to the tunnel, and also at the roundabout, and we want to alleviate that. “We are carrying out engineering work which will see both lanes leading to the tunnel from Jarrow being permanently opened up. TT2 says the move continues its ongoing commitment to improve journey times. Last month, it instigated a two-week traffic lights trial at the Jarrow entrance to see if crossings could be speeded up. That also came in response to dialogue with drivers who raised concerns about difficulties filtering onto the A19. The opening of the £260m new Tyne Tunnel, which is used by around 50,000 vehicles a day, drastically reduced commuting times. The original single lane Tyne Tunnel was opened by the Queen in 1967.